You hear the most amazing stories on chairlifts. Especially six-packs or quads, where you get the interaction of different groups. This story has been changed to protect the innocent. I make no attempt to verify facts. Let's call it high-speed fiction. Spring arrived early at Majestic Mountain. Days were warm and skiers flocked to the slopes to enjoy some great corn snow. The BBQ was going on the mid-mountain deck, the tunes were blaring and the attitude was kicked back and mild. "What a great day to come out of my cave," thought little brown bear. "I smell something awfully good." And so it goes, the little brown bear wandered out to see where that aroma came from. He blundered down the hill (ignoring the curious snowboarders and skiers) and went right up to the deck to get a good whiff of some fresh burgers and grilled chicken. Hark, the little brown bear created such a sensation. Ski area employees rushed to secure the area from this little brown bear .. so imposing was he. Chairlifts were closed, troops brought in. Finally the little brown bear was forced up a tree from dutiful employees. The skiers went about their business of fun and the little brown bear sat frightfully in his tree. Being responsible ski operators, the head honcho up there at Majestic Mountain called the head bear people and told them about their little friend. 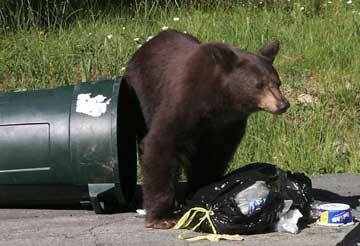 The bureaucrats said they would send someone up to dispose of the bear (the bear population being too large). But no! Certainly they could just relocate the little fellow.. he was just hungry.. and not really a threat to the ski population. (And think of that negative publicity). No - no relocation, just disposal. No thanks said Majestic Mountain, this is private property - we'll take care of the problem. As the alpenglow came about, those dutiful employees were determined to herd the little brown bear back to his habitat. Lured down and herded towards home, he was just about there when he got another whiff of fresh burger from another mountain top restaurant. That little brown bear beelined it straight for that lakeview restaurant.. and whoops, before you can say halt, he fell right in the pool! What a site, that little brown bear traumatized by Jacuzzi's and air filters.. at least he had the pool to himself. Well those Majestic Mountain employees were more determined than ever to save this little bear. They grabbed some fresh burgers and once again lured this little bear towards safety. No one is quite sure how they did it, but they got the little brown bear into a snowcat troop carrier, happy with his meal, and off they went into the sunset. They freed the little brown bear and smiled as they went down the mountain. Well, the authorities up at bear country didn't like it one bit. A citation came along with a hefty fine for Mr. Majestic Mountain for illegally transporting wild animals. But we saved his life! Alas, this kind of behavior is illegal in this state. And so.. that would be the end of this bear tale - but that little brown bear was determined to come back for more burger. He showed up a few days later. This time the bear preservation people came to take charge. (No one owns up to how they knew when this little brown bear showed up again). And before you can say, "Call Fish & Game", they had trapped that little brown bear and transported him down the mountain (a little mystery here, the only way down the mountain is in a state of the art - only one in America - lift that carries 28 passengers). We believe the bear traveled alone. So the bear preservation people rushed away with little brown bear to take him to a bear safety house. Unfortunately enroute, they were apprehended by those folks who want to decrease the bear population. And so the story ends, with the fate of little brown bear held in bureaucratic hands. Poor little brown bear, he just wanted a burger. Story by Tammie Thompson who has a great website called Kidz n'Snow, dedicated to providing information to families with children traveling to the snow. It includes resort, gear, travel and sports information.